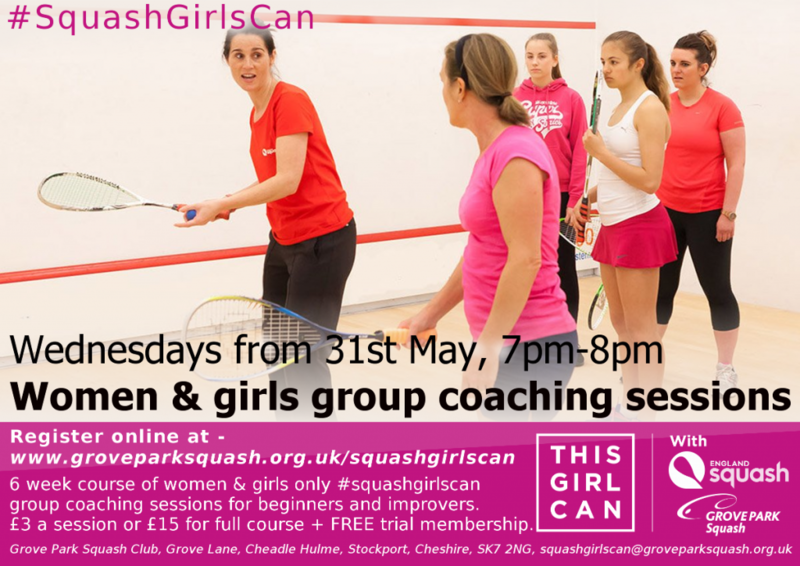 It was great to see so many new faces at the #SquashGirlsCan beginners’ session on Saturday and I am now pleased to provide details of the forthcoming #SquashGirlsCan coaching and ladies nights at Grove Park Squash Club. The sessions will run initially for 6 weeks from 7pm to 8pm starting on Wednesday 31 May with our Level 2 qualified club coach, Jules Abbas. There will also be the opportunity to play some friendly games after each session, or alternatively, you can retire to the bar for a drink!! For all the sessions, we will provide rackets, balls and equipment as necessary. We want these to be fun sessions for beginners, and also want to encourage participation from ladies / girls who would like to improve their squash in a friendly, fun and supportive group. All ages and abilities are welcome, including junior girls and our current lady members, to come along and enjoy their squash regardless of level. Though the session will be structured according to ability. Full access to the other club facilities, including the bar! Alternatively, you can pay £3 per Wednesday night session on a “pay as you go” basis. For the trial membership, you can pay cash on the night or pay via Worldpay once set up on our internet court booking system. We hope you will take advantage of this #SquashGirlsCan initiative and we look forward to seeing you next Wednesday, 31 May.